Avinash Chandra has a post graduate degree in Journalism and Mass Communication, and has a diploma in digital video production. Avinash has five years experience working with Dainik Jagran (world's largest reading daily Hindi newspaper), Rashtirya Sahara and Amar Ujala. 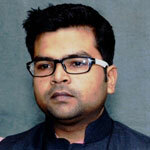 He has also worked for All India Radio, Doordarshan, Pragya TV and various production houses. As a journalist, he has covered health, art and culture, education, and water, among various beats. He is Editor of azadi.me, our Hindi language portal.